Are you ready to be inspired? This is the beginning of a satisfying creative process and the opportunity to learn a unique set of skills that may lead to a profitable hobby or career. You will be able to explore the secrets of traditional art of Japanese flower making, without leaving your home. Our tutorials will show you how to create unique floral accessories, with detailed instructions not found in books. In this video tutorial you will learn practical information about mixing dye colors to achieve amazing results, coloring, shaping silk calyx using Japanese professional tools and placing it on a silk rose. The video tutorial contains 1 video file, over 30 minutes of video instruction, to be downloaded to your computer + text PDF file with instructions of preparing the fabric, suggestions for choosing fabrics and the pattern of this calyx. Begin the creative process now! After your payment is received, Paypal will redirect you to the page with VIDEO tutorial. 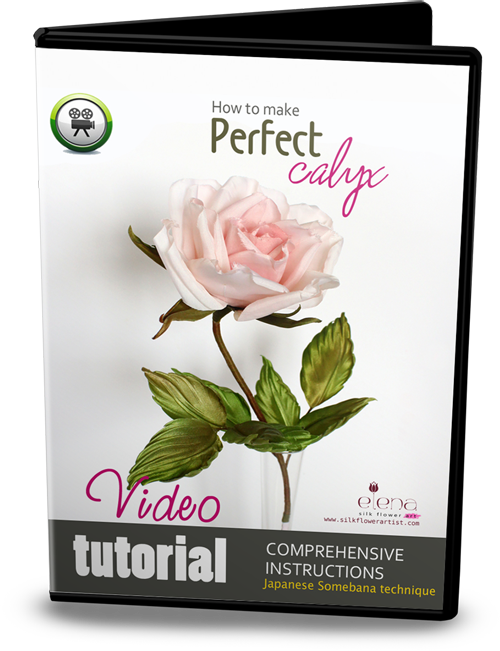 Follow instructions to download the VIDEO tutorial you have purchased.Copyright © 2012- 2018 Lady Elena Bain ~ The Silk Flower Artist. All rights reserved. This video tutorial is for personal use only. The reproduction, distribution, or copying of any part of this document in whole, or in part, or in any form, and without written permission, is strictly prohibited and will be prosecuted.